There is a certain incongruity when it comes to soft play centres. They are inevitably located on an industrial estate, housed within a corrugated metal shed which is typically between R J Gubbit & Sons aluminium widget manufacturing, and a waste disposal site specialising in storage of some sort of harmful substance (anthrax perhaps). After paying to get inside (the price is dependent on the number of people entering, including adults, even though I have no intention of doing anything more energetic than unlocking my phone), you then suffer the price of refreshments. Entry, two wedges of additive-loaded cake, a fruit shoot, a ham sandwich that must have cost all of five pence to make, and a bottle of chilled water that never materialised cost a touch off seventeen pounds. After spending so much I needed a sit down. And of course a slice of cake, coloured like something you might observe in a nuclear power facility. But the difference between soft play and a park is that in a park, you can actually reach the children. If your child needs adult intervention then in a park you grab them, remove them from whatever swing or slide or bouncy thing they are on, and sort things out. In soft play however they are contained within some sort of mesh curtain, and the only way to get to them is to wriggle your way round the brightly coloured assault course that is designed for children (and so is far too small for you). The result of this is that you are not going to catch them, no matter how many slides you go down or ball pools you swim through. Soft play is usually broken down into several sections for different ages, and rest assured that your child won't be in the one they should be - either they want to go on the biggest slide (until they get to the top and begin to cry, forcing you to tackle the route through the foam maze to rescue them), or they're in the section reserved for babies, because it makes a lot more sense to throw plastic balls at babies - after all, they can't fight back. When you've finally, after about seven minutes, been through the Soft play area for a fifth time to pick your little darling up, you may be ready to go home. Some people say rocket science or brain surgery are tricky - no, I think you'll find that catching a child in a soft play centre that doesn't want to be caught is the hardest task in the world. Not only do you have to catch your child, a little human who has spent their entire life learning how to slip from your grasp, and is in an environment which makes you feel as though you're a Gulliver in a particularly strange jungle constructed from plastic and foam. Should the amazing actually happen and you do actually manage to get them you then need to get their shoes and coat on while holding them in a grip of iron to stop them escaping. Meanwhile of course you are putting on a smiley face and a cheerful tone of voice so you seem like a cool parent who thinks its fun to get poked in the eye by a child being removed from a place where they can run, shout, jump, hit other children, and cry, without recrimination. Still, at least it's not the supermarket. 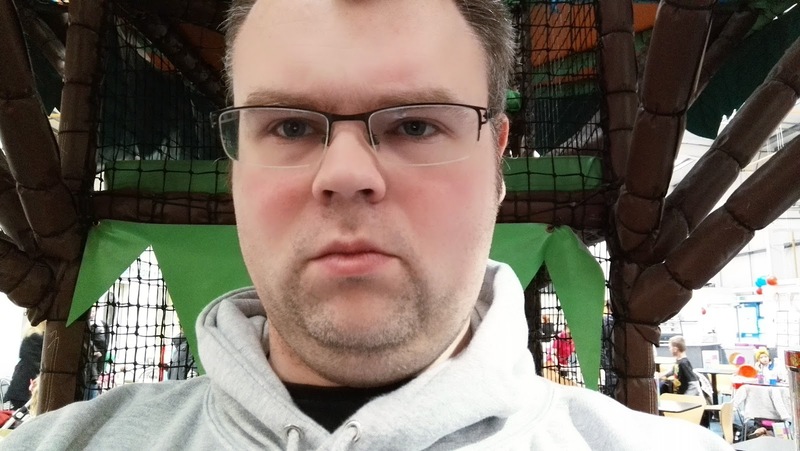 I am apparently beginning a tradition of once a year, in January, blogging about soft play centres. Why not check out last years post? They need to make those for adults, imagine the exercise of hauling an adult sized carcass up those flimsy inflated stairs and the aerobic terror of sliding down. All in the name of good health. I bet! My son made me go round with him last time we went, and trying to squeeze through all of the little gaps and clambering over obstacles was a good exercise! I remember you threatening to take the office to one of them. Having taken the girls to a few, what we need is one of those restraining bolts droids in Star Wars can have that make them come back to you when activated. Hey blogger the best blog ever you write for soft play environment with think about kids health. Thank you so much telling us great information !!! This sounds WAY better than the market or the shops. Aren't they the no holds barred environment for adults? You made me want to be a kid again!